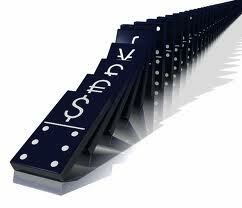 Collateral Concentration Risks : Are we inviting the Systemic risk ? Deja vu all over again, the over-reliance on ‘shaky’ collateral and concentration of risk is building once more – this time in the $648 trillion derivatives market. New Clearing House rules (a la Dodd-Frank) mean derivatives counterparties are required to pledge high quality collateral with the clearing houses (or exchanges) in a more formalized manner to cover potential losses. However, the safety bid combined with Central Banks monetization of every sovereign risk asset onto their balance sheet has reduced the amount of quality collateral available; this scarcity of quality collateral creates liquidity problems. The dealers, ever willing to create fee-based business, have created a repo-like program to meet the needs of the desperate derivative counterparties – to enable them to transform lower-quality collateral into high quality collateral – which can then be posted to the clearing house or exchange. This collateral transformation, while meeting a need, runs the risk of concentrating illiquid low quality assets on bank balance sheets – as Bloomberg cites Darrel Duffie: “The dealers look after their own interests, and they won’t necessarily look after the systemic risks that are associated with this.” Regulators are aware of this but as always will be slow to react – until it becomes too big to fix. The CME already accepts corporate bonds as collateral, but the re-collateralization and potential for vicious circle cash calls or forced selling become notably higher as “We just keep piling on lots of operational risk as we convert one form of collateral into another,” said Richie Prager, global head of trading at New York-based BlackRock. Mandating collateralized clearing makes sense from a risk perspective but the daisy-chain of collateral calls and pain that this collateral transformation could create will inevitably be the undoing of the massive derivatives should we see any kind of systemic risk event reoccur – a scenario not with de minimus likelihood in our current game of central bank chicken. The process merely extracts even more quality collateral, while concentrating bad collateral. In essence the next blow up risk is the eureka moment when all banks are forced to look at the cross-posted collateral. Last time it was the ‘fair-value’ of housing, now it is the ‘fair-value’ of ‘transformed’ collateral that is pledged at par and is really worth nickels on the dollar.